Day One: Embarkation....Ticket to Adventure! 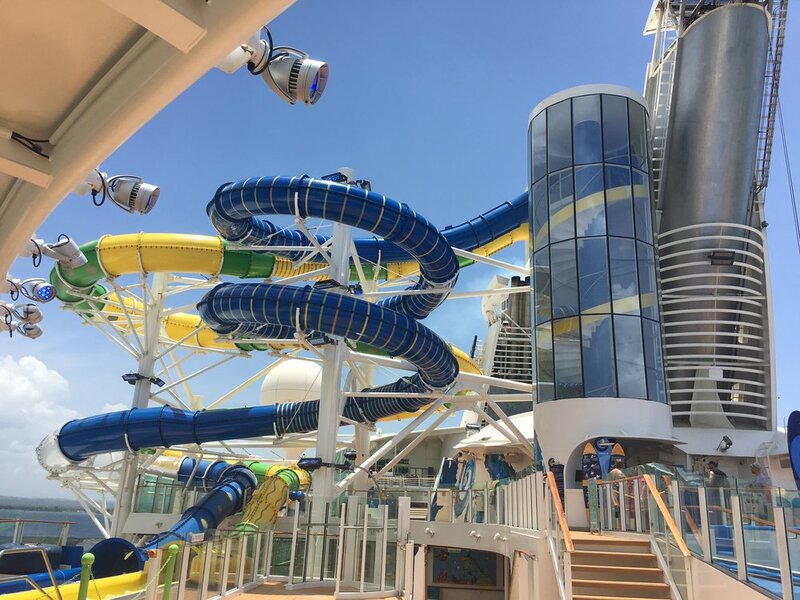 Hello from the beautiful Adventure of the Seas! As I said yesterday, we stayed at the wonderful Condado Plaza Hilton. I didn't sleep too well, so I ended up taking my iPad out onto the balcony at about 3 AM. Not a bad place to not be able to sleep as after awhile, I saw Adventure sail right in. What a beautiful sight at night! (My family may not agree as much with me, as I woke most of them out of a dead sleep to see the ship sail in). As you may know, you are given boarding times. We were given a time somewhere between 4-6 PM. However, that wasn't going to work for us. We booked our shuttle months earlier, and arrived at the port at a little after 10 AM. An hour later, we handed our luggage over to the porters, and we were inside getting our coveted sea pass cards. There isn't much of a seating area at the Pan Am Pier, and they told us all a few times to have a seat in the non existent chairs. I can definitely understand why they are planning to upgrade the pier with Freedom coming. Less than a 1/2 hour later, we were allowed through the magical gate, and we were on the way up to the gangway to the ship. As soon as we reached the escalator to go up...BAM...torrential downpour. We got a little wet, as there is one area between the gangway and actual ship that isn't covered. Who cares....we were getting on a ship! First stop...the pool. We were the only ones in the pool for awhile. It was lovely. The kiddos and hubby wanted to do the Flow Rider and the water slides, so we headed up there. HALT.....ph levels were too high so neither could open. We waited for a little bit....but it never opened. Instead, we headed to our room and unpacked (as unpacking keeps us organized). Then we headed to Guest Relations to drop off an iPad left in our safe. We were then off to the Windjammer. OMG....the crowds. It turns out that the Windjammer had an unexpected inspection, and thus it opened up late. We were able to grab a little snack and move on. We went back to the room for a 1/2 hour of down time until the muster drill (which went smoothly). Dinner was delicious. My son is called "Cruising Cantaloupe Connor," because the two things he loves is cruising and cantaloupe. The waiter brought him two big bowls of cantaloupe. He was in heaven. We then went back to the room for a quick bathing suit change, and headed to the pool. The kids are happily playing and the husband and I are enjoying Margarita Azul's during the sail away party. The plan for the rest of the night is to watch a movie on the deck and relax as this vacation prescribes! What's up tomorrow? It's a Sea Day....so who knows what kind of trouble we will get into! Until tomorrow!